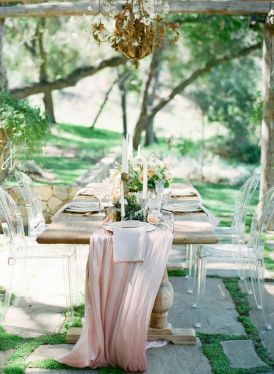 The humble cheesecloth, recently featured at New York Fashion Week, is a material I’m seeing being used in really creative ways to style tables or give texture to event decor. It really adds an understated elegance and works for any event – a birthday, engagement party or a wedding! Here are just a few ideas we’ve found to get you, and us inspired! Use it as a runner, it looks beautiful on a wooden table! Simply run it across the middle of the table and if you like, roughly bunch the ends with some thick ribbon. 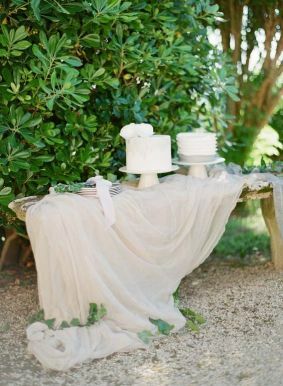 Drape a it little more effortlessly over a feature area of your room, like the cake table! 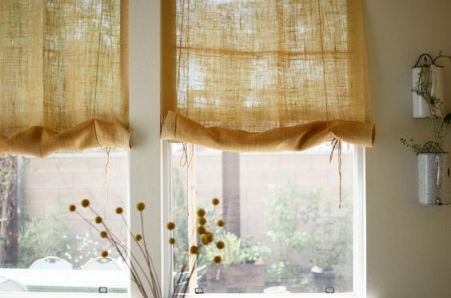 Make simple cheesecloth curtains – the light will filter through the delicate fabric and add a warm glow to your room. Combine it with other fabrics like burlap for added texture! You can even dye it to add a subtle nod to the colour theme of your event. Creams, blushes and soft pinks work perfectly with the natural texture and colour of the fabric. Want to make a bigger statement? 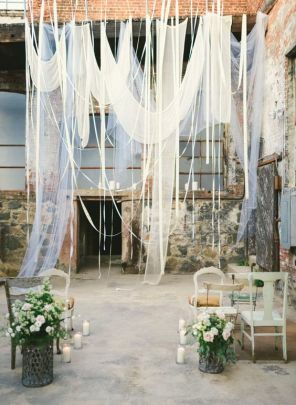 Make it a main feature, like here where it has been hung from the ceiling for a wedding ceremony. There are also many more subtle ways where it can be used, like tying a piece of it to hold cutlery together, bow it on a cake knife, or wrap your guest’s bonboneries in it!